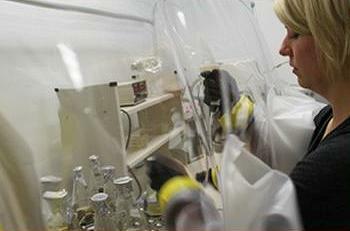 COLLEGE PARK, Maryland, November 14, 2012 (ENS) – The “superbug” methicillin-resistant Staphylococcus aureus, or MRSA, is prevalent at several U.S. wastewater treatment plants, scientists have found in the first study to investigate U.S. wastewater as an environmental reservoir of the bacteria. MRSA is well known for causing bacterial infections that are difficult to treat and potentially fatal in hospital patients. Since the late 1990s it also has been infecting otherwise healthy people in community settings. “MRSA infections acquired outside of hospital settings – known as community-acquired MRSA or CA-MRSA – are on the rise and can be just as severe as hospital-acquired MRSA,” says research study leader Amy Sapkota, assistant professor in the Maryland Institute for Applied Environmental Health. “However, we still do not fully understand the potential environmental sources of MRSA or how people in the community come in contact with this microorganism,” Sapkota said. The study indicates that wastewater treatment plant workers and anyone who lives, works or plays near wastewater treatment plants could be exposed to these superbugs. Because infected people can shed MRSA from their nostrils and skin and through their feces, wastewater treatment plants are a likely reservoir for the bacteria. Swedish researchers have identified the presence of MRSA in wastewater treatment plants in Sweden, and this new study confirms the presence of MRSA in U.S. facilities. The research team, including scientists from the University of Maryland School of Public Health and the University of Nebraska Medical Center, collected wastewater samples throughout the treatment process at two Mid-Atlantic and two Midwestern wastewater treatment plants. These plants were chosen, in part, because treated effluent discharged from these plants is reused as reclaimed wastewater in spray irrigation activities. The researchers were interested in whether MRSA remained in the effluent. They found that MRSA, as well as a related pathogen, methicillin-susceptible Staphylococcus aureus, or MSSA, were present at all four wastewater treatment plants, with MRSA in half of all samples and MSSA in 55 percent of the samples. MRSA was present in 83 percent of the influent – the raw sewage – at all plants, but the percentage of MRSA-and MSSA-positive samples decreased as treatment progressed. Only one wastewater treatment plant had the bacteria in the treated water leaving the plant, and this was at a plant that does not regularly use chlorination, a tertiary step in wastewater treatment. “Our findings raise potential public health concerns for wastewater treatment plant workers and individuals exposed to reclaimed wastewater,” says Rachel Rosenberg Goldstein, environmental health doctoral student in the School of Public Health and the study’s first author. Ninety-three percent of the MRSA strains that were isolated from the wastewater and 29 percent of MSSA strains were resistant to two or more classes of antibiotics, including several that the U.S. Food and Drug Administration has specifically approved for treating MRSA infections. At two wastewater treatment plants, MRSA strains showed resistance to more antibiotics and greater prevalence of a gene associated with virulence at subsequent treatment stages, until tertiary chlorination treatment appeared to eliminate all MRSA. This suggests that while wastewater treatment plants effectively reduce MRSA and MSSA from influent to effluent, they may select for increased antibiotic resistance and virulence, particularly at those facilities that do not employ tertiary treatment with chlorination. Frequent hand washing and the use of gloves by wastewater treatment plants workers could reduce risk and through tertiary treatment of wastewater that is to be used for irrigation. The study is published in the November issue of the journal “Environmental Health Perspectives,” a publication of the U.S. National Institute of Environmental Health Sciences.